Yes – I am fully aware that Mardi Gras was this past Tuesday. I am fully aware those who celebrate this time of the year have been doing so since the end of January and ends on Mardi Gras. But what’s a working mama to do but to celebrate the weekend after? We decided to have a little impromptu dinner party with a few close friends and make some foods traditionally found in the South. Our original menu was going to consist of Shrimp étouffée, Shrimp and andouille sausage over grits, corn macque choux, and, for dessert, a King Cake. Due to a cold, TJ and I decided to scale back the menu just a touch and opted to leave out the shrimp and grits. 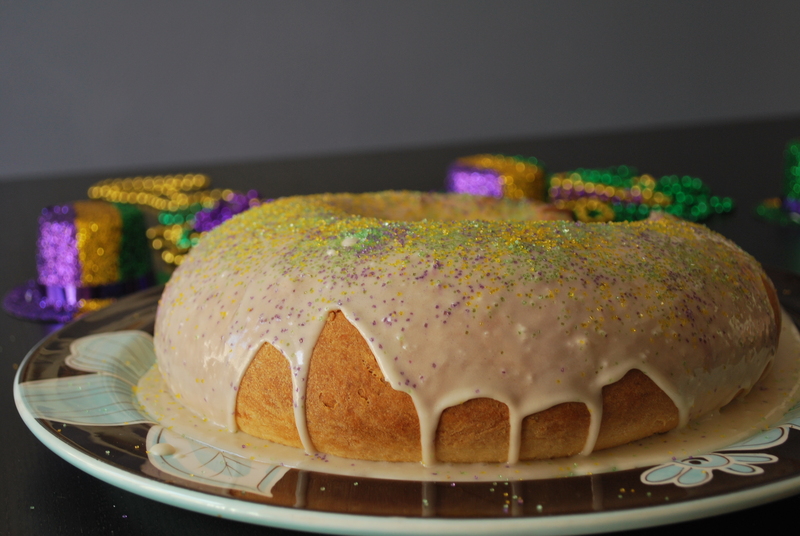 If you’re not familiar with a King Cake, it’s a traditional cake associated (in some parts of the world) with the pre-Lenten celebrations before Mardi Gras. The cake is traditionally round or oval, like a crown, and has a little baby hidden inside or underneath (whoever gets the slice with the baby is the ‘King’ or ‘Queen’ of the party. It is also said whoever gets the baby will have good luck. It may also mean that you’ll have to bring the next King Cake to the next party). Why is it called a King Cake, you ask? I’m about as knowledgeable about religious matters as I am about car engines (which means I barely know anything), but from my understanding, Kings Day is the date when the three kings or Magi supposedly arrived at the manger with those gifts for Jesus. That explains the King Cake name as well as the baby. 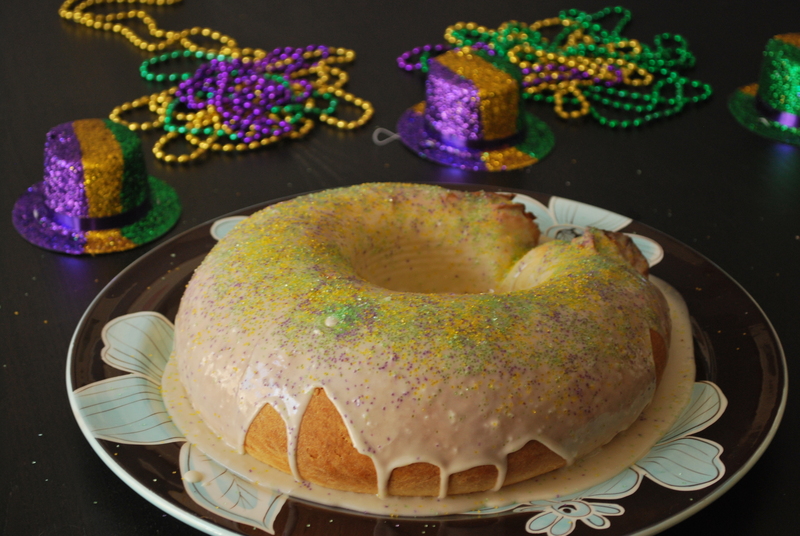 The modern-day King Cake comes in a variety of fillings and flavors now and can often be found outside of the traditional King Cake ‘season’. King Cakes are delicious, but I must warn you – – when I say cake, I think it conjures up images of light, fluffy cake, like the kind you’d get at a birthday party. But King Cake tends to be on the denser side. TJ and I had seen a ready-made King Cake at our local Whole Foods for sale and decided we’d try and make our own. For our first attempt, I must say, it turned out lovely. Definitely not perfect, but not too shabby, I must say. If you’d like to try out the recipe, well, get ready, becomes here it comes. Combine the warm milk, yeast, and 1 teaspoon of sugar. Let it proof. What you’ll see after a bit is that the yeast will start to activate and get bubbly in the warm milk. While you’re waiting for this mixture to get frothy, whisk the butter, egg yolks, and vanilla extract together. 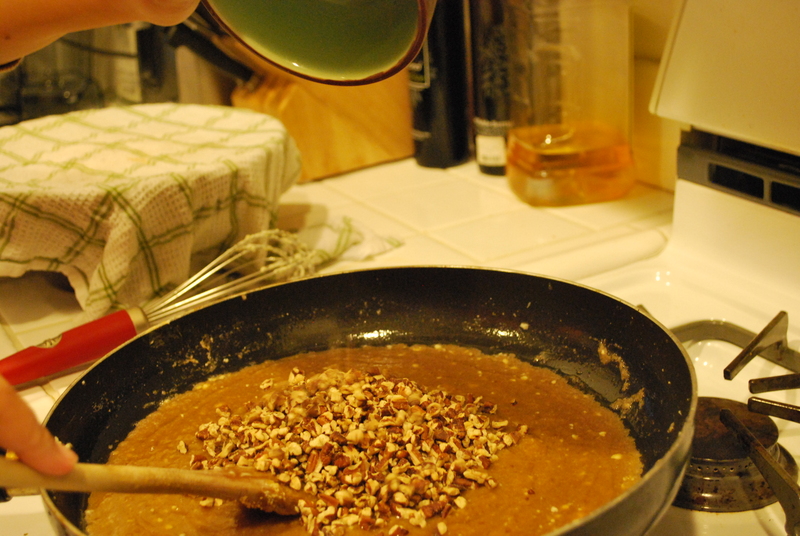 In a large bowl, combine the remaining 1/4 cup sugar, flour, nutmeg, and salt. 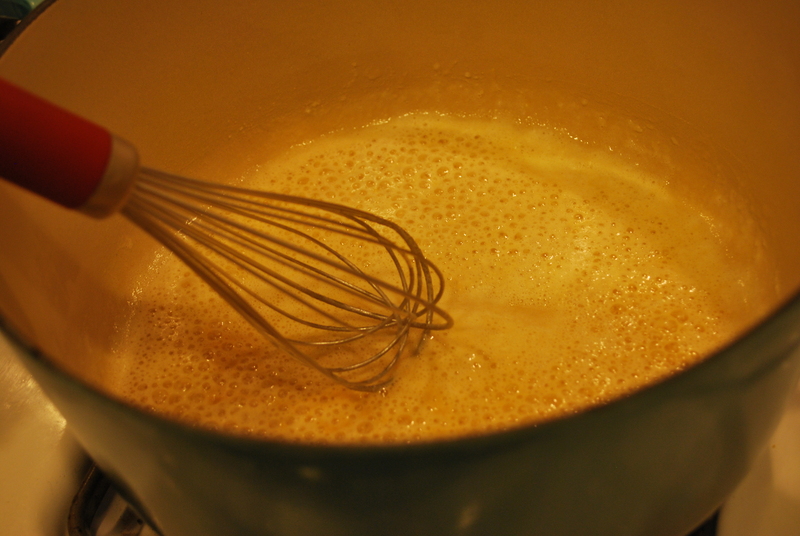 Once the yeast mixture is foamy and frothy, add it to the dry ingredients along with the butter mixture. Knead the dough on a floured surface, working it for about 7 minutes. Transfer the dough to a greased bowl. 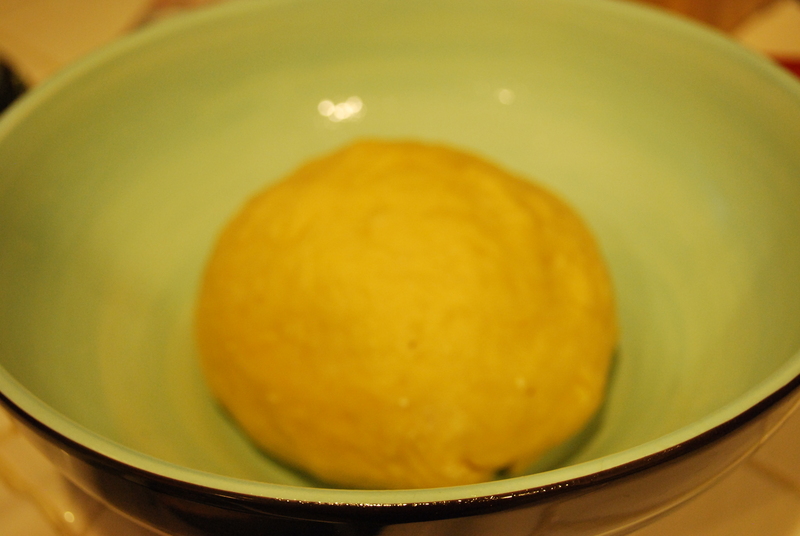 Cover the bowl with a damp towel and let the dough rise for 2 hours (until it has doubled in size). As the dough begins to rise, make the filling. 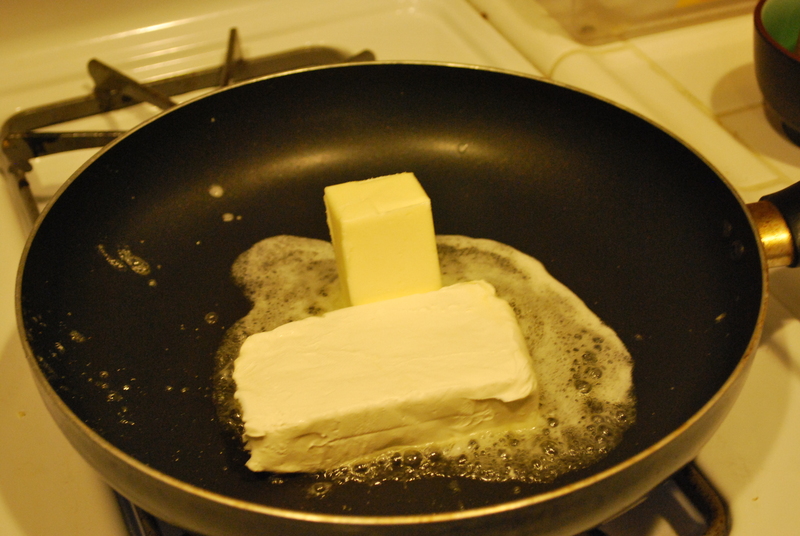 Melt together the butter and cream cheese in a large saucepan. Stir in the brown sugar and mix it until the mixture starts to bubble. 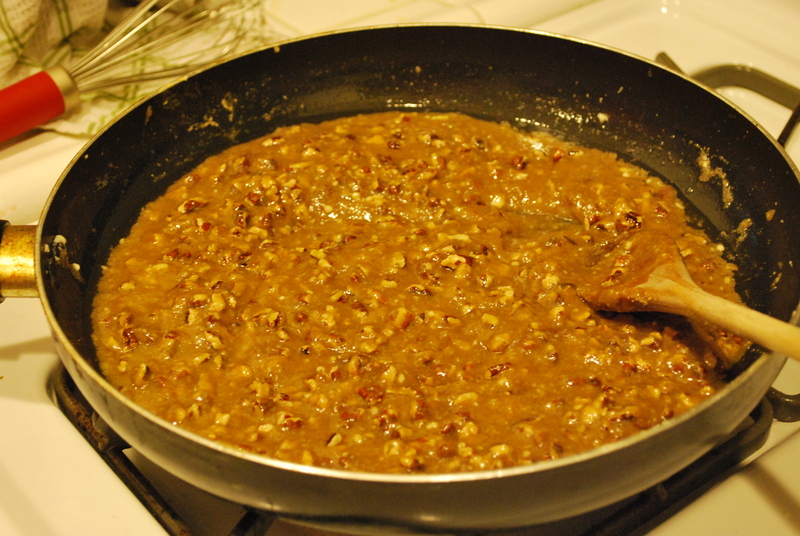 Take the pan off the heat and stir in the pecans. Set aside the mixture to cool while the dough finishes rising. 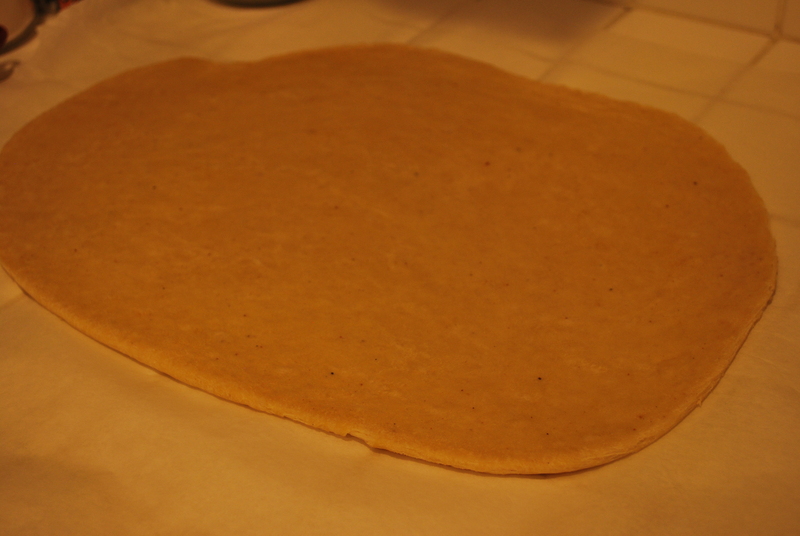 Once the dough has risen, transfer the dough to a large piece of parchment paper. 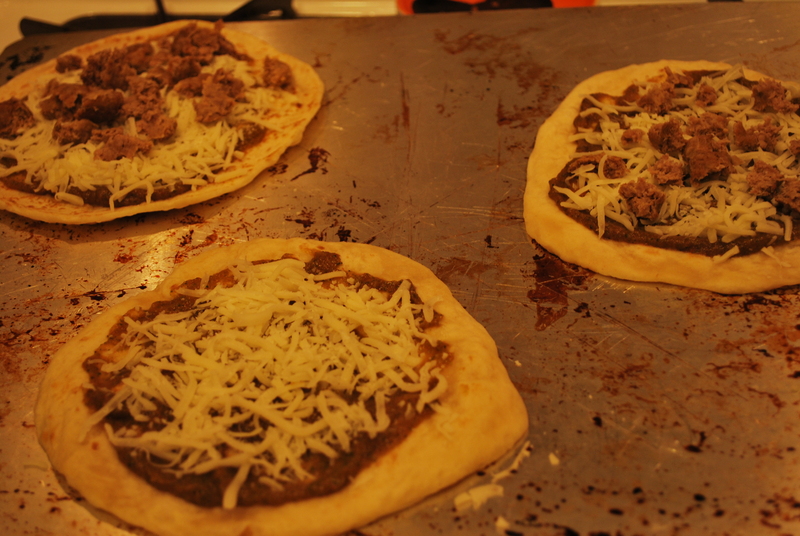 Roll out the dough to about a 9×13 size. 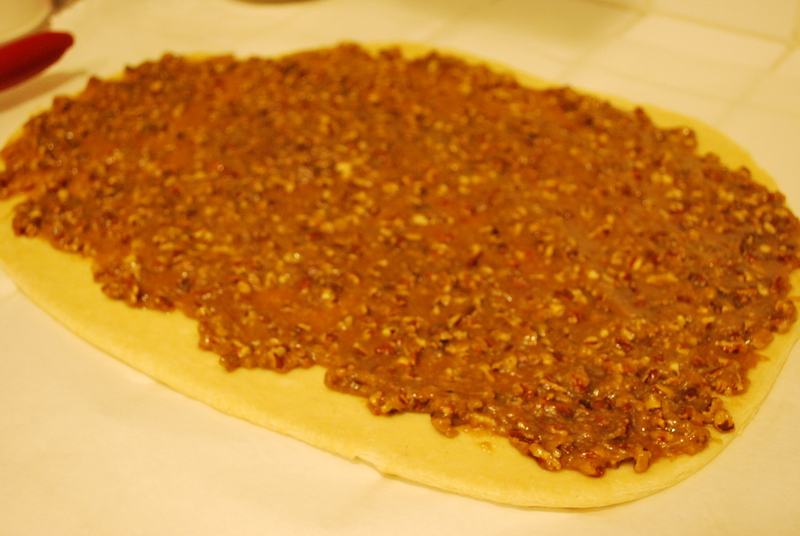 Spread the pecan filling evenly onto the dough, leaving an inch along the sides so the filling doesn’t ooze out. 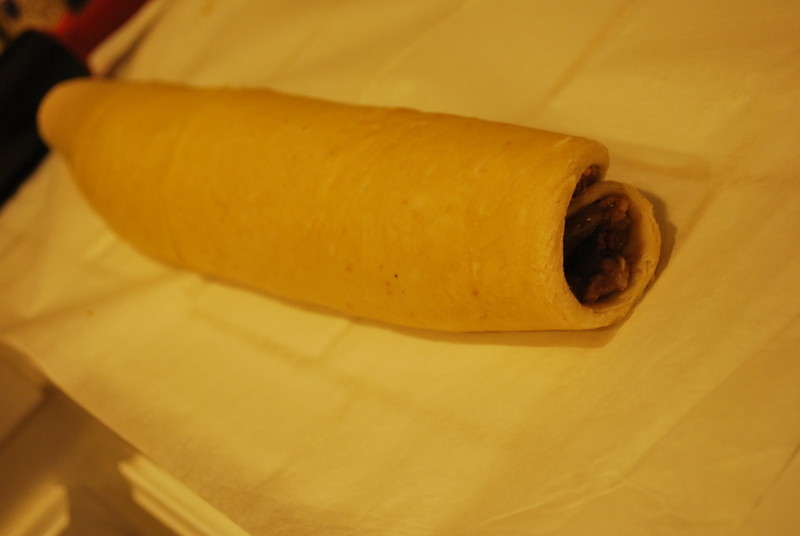 Starting on the long opposite side, gently roll up the dough and filling. If you’ve gotten yourself a little baby, feel free to hide it inside somewhere at this point (or once it is done, just slip it underneath the cake). Grease an empty and clean 28-oz can and place it in the center of a large baking sheet that’s been lined with parchment paper. 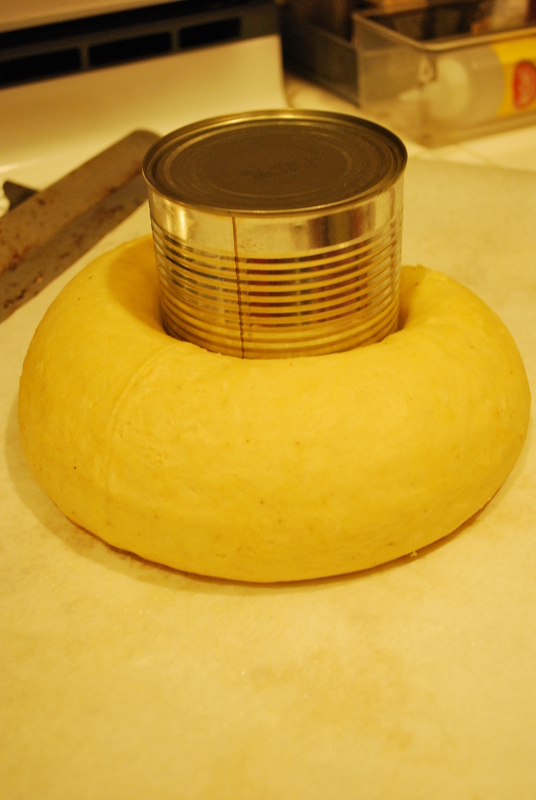 Gently wrap the dough around the can (put the seams of the dough on the baking sheet) and pinch together the ends well. Let this rise for another 30 minutes. Preheat your oven to 350 degrees. Once the cake has finished rising for the additional 30 minutes, pop the cake in the oven for about 30-40 minutes, until cake is a beautiful brown color. 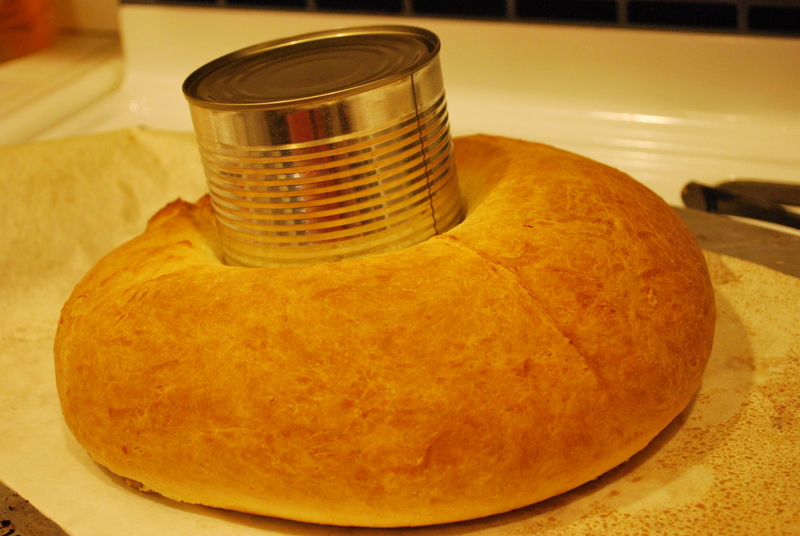 As soon as your cake comes out, carefully remove the can from the middle of the cake. Let the cake completely cool before you glaze it. 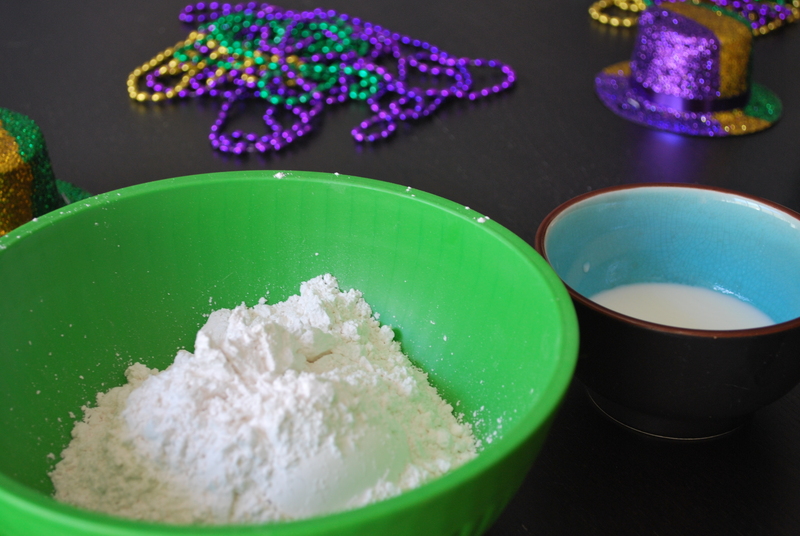 To make the glaze, simply whisk together the powdered sugar and 3 tablespoons of milk. Add a bit of more milk to the glaze mixture if it’s too thick for your taste. 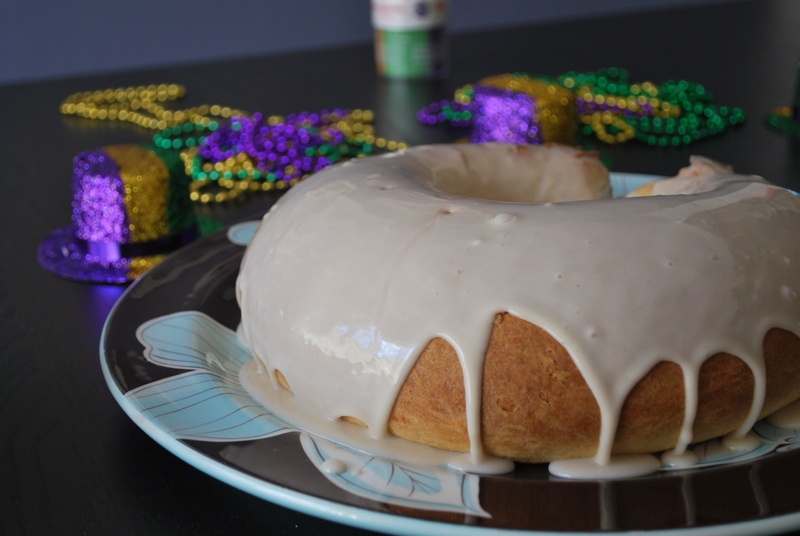 Pour the glaze onto your cooled King Cake and go crazy with your decorations. And there you have it! Certainly not low-calorie. Certainly not super low sugar. But it’s a treat you’re likely getting about once a year and I strongly believe in moderation is key. So, while I cannot say that this is low-calorie or low in sugar, I can guarantee you it Tastes Oh-So-Good! Happy belated Valentine’s Day! I hope your weekend was filled with tons of love and affection. And, if it was anything like our weekend, filled with food. TJ and I never celebrate Valentine’s in the most traditional of ways. We always celebrate a day or two (sometimes a week) before or ahead (who needs to fight all those crowds?!). We have opted for cheap, delicious meals in lieu of fancy shmancy overpriced restaurants. We have gone to Disneyland instead of doing anything too romantic. We’ve even done a scavenger hunt race. Now, that we have Olivia, we wanted to continue our non-traditional celebrations, but also sprinkle in a little of that cheesy heart stuff that a little kid loves. So, our weekend was full of food. It is the way we would celebrate, after all! Instead of boring you with all that we ate, I’ll share with you what we had last night. We went to an incredible restaurant downtown, Marugame Monzo. They specialize in handmade udon noodles. Oh man. We had such a fantastic time. Olivia had a whole bowl of Zaru Udon (chilled noodles with a dipping suace) to herself! Man, can that girl eat! After dinner, we headed to The Pie Hole, a fantastic place that specializes in all things pie, both sweet and savory. We, of course, had a little sweet treat to end the night. Needless to say, we need some healthy meal alternatives to counter-balance all those indulgences! If you’ve read some of my past posts, then you already know that I’m heading straight to our Quinoa. It’s such an easy choice for us. High in fiber and protein and, best of all, Olivia loves it! We chose to make a casserole dish. We saw a recipe that was similar to this that used brown rice, but since we’re on our quinoa kick, we decided to substitute it. 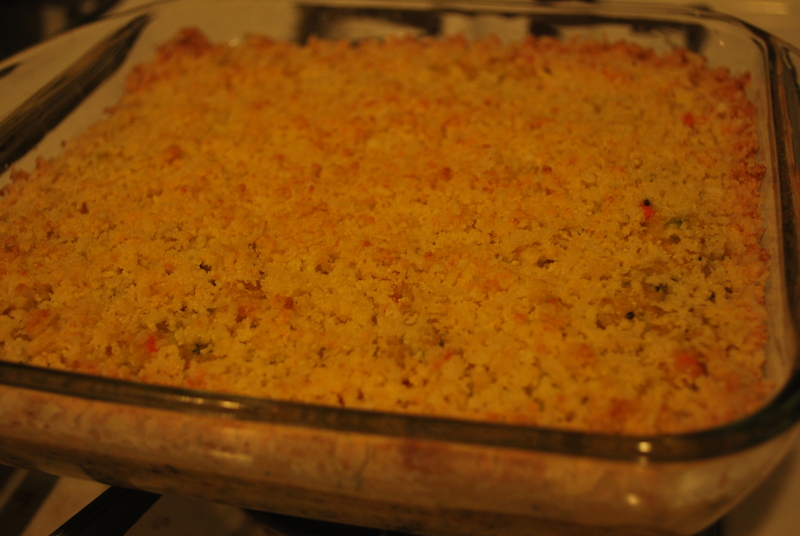 This is a lovely cheesy casserole dish with tons of vegetables. It’s super easy to make – which is always a great perk! As always, you can substitute whatever veggies you have on hand. 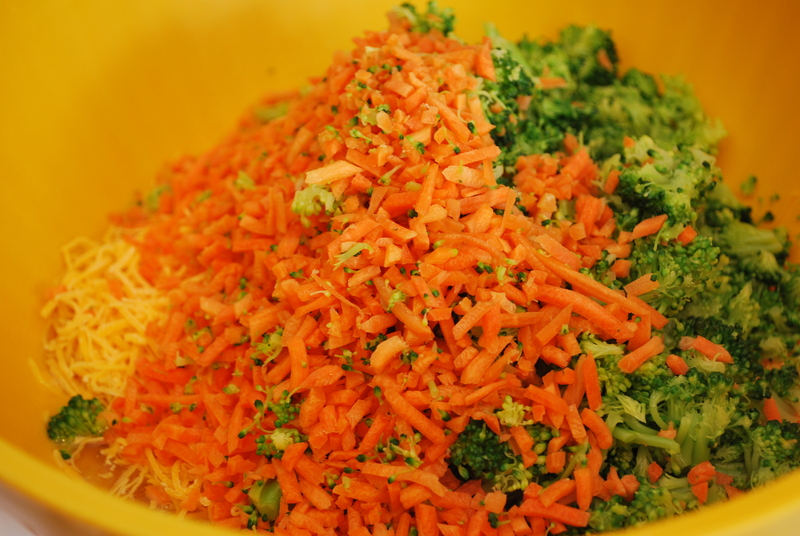 Today, we used carrots, broccoli, cauliflower, onions, and peas. Also, Enough chattin’ – let’s get started! Preheat your oven to 375. 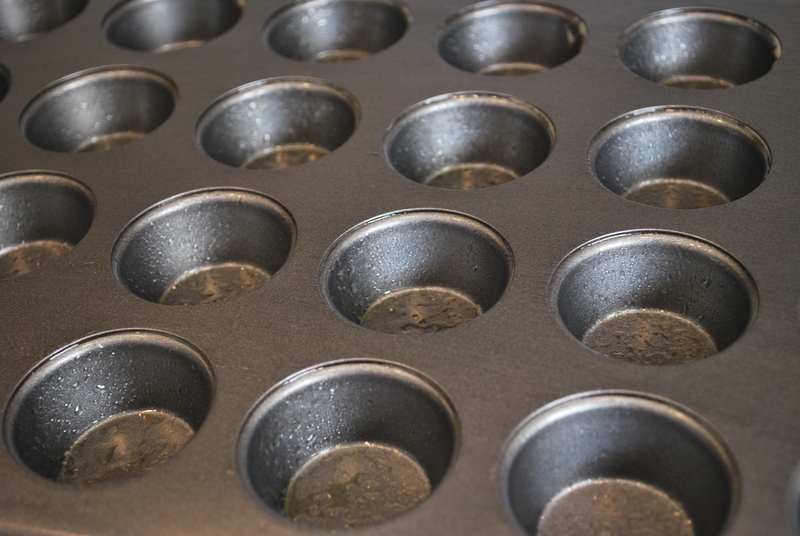 Grease an 8×8 baking dish. We greased ours with a little coconut oil. 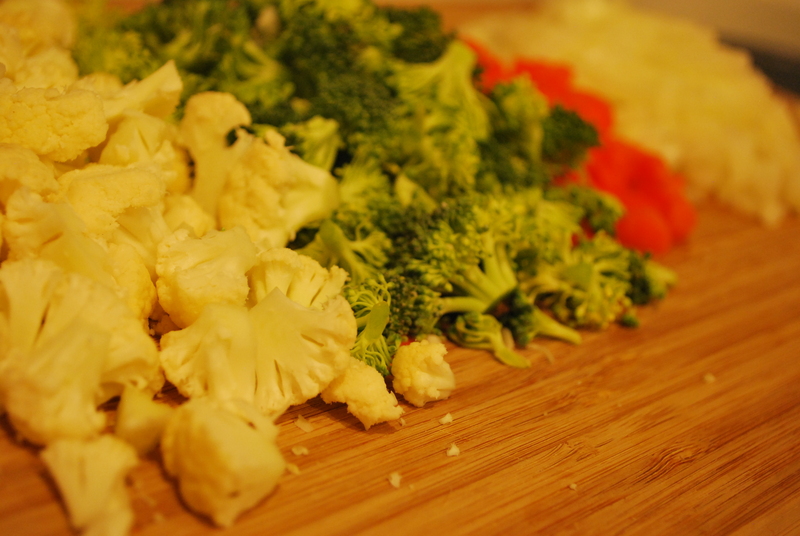 Make sure your veggies are chopped up into bite-sized pieces. 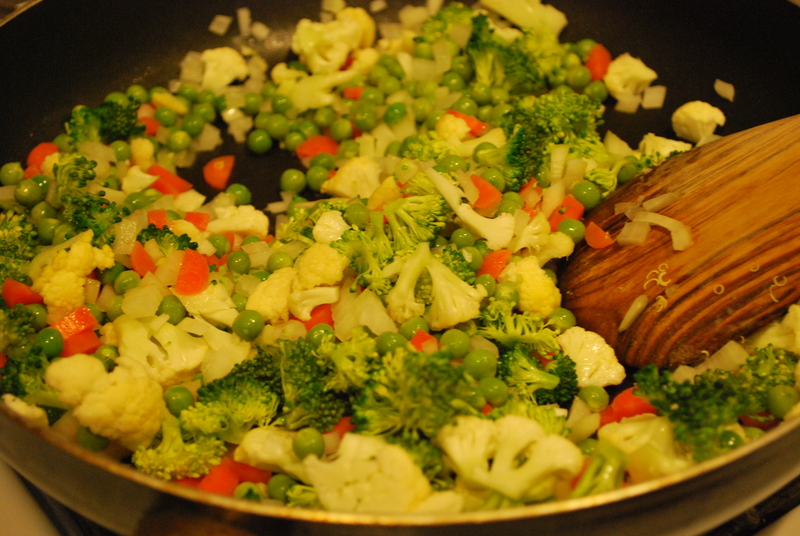 Heat your oil in a large saute pan and add your veggies. Saute the vegetables until the vegetables are tender. Transfer the cooked vegetables to a large bowl. Add 1/3 cup of pasta sauce, 1/3 cup of ricotta, and 1 cup of the mozzarella. Stir to combine. 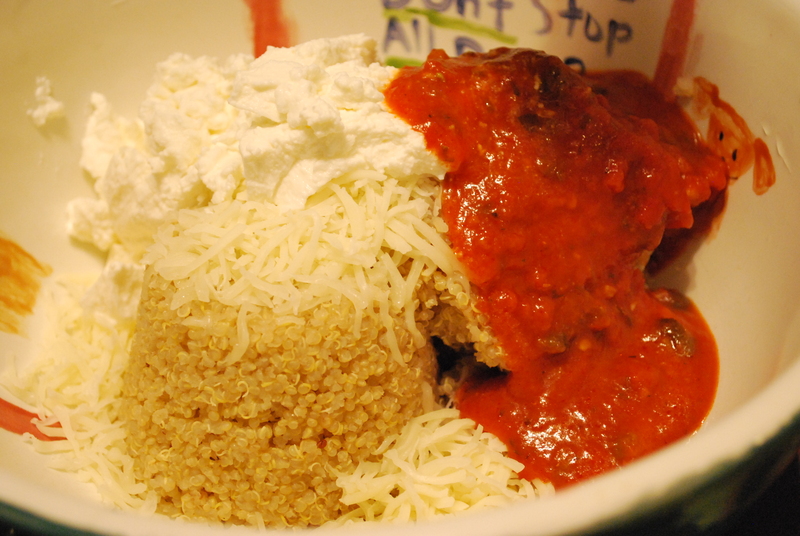 In another bowl, combine your quinoa, salt (if you’ve chosen to include it), 1/2 cup pasta sauce, 1/2 cup ricotta, and 1/2 cup mozzarella. 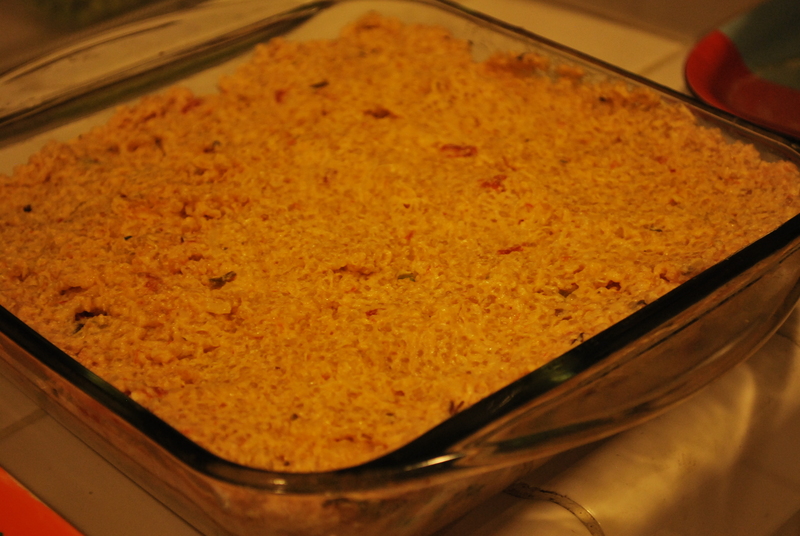 In your baking dish, press half of your quinoa mixture into the baking dish. 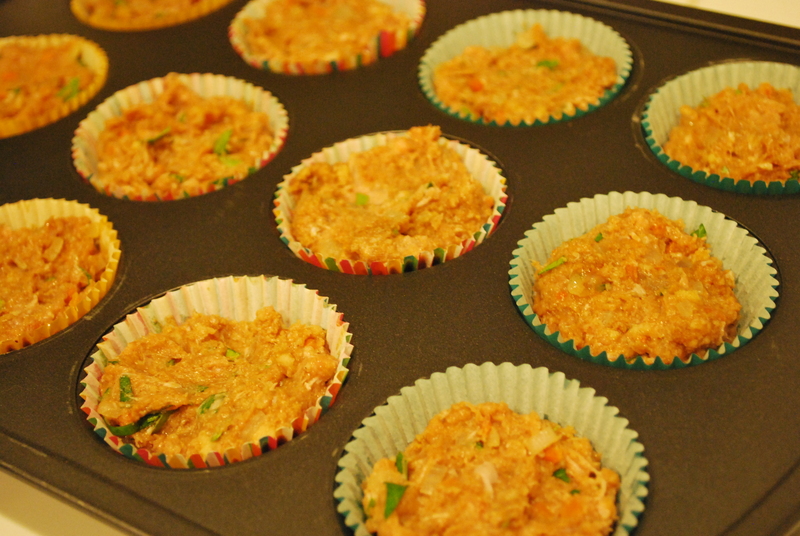 Spread all of the vegetable mixture on top, followed by the remaining quinoa mixture. Bake for 50 minutes. Once it’s done, allow it to cool for around 30 minutes before you serve it up. Fiber? Check! Protein? Check! Veggies? Check! Healthy? Check! It passes a bunch of tests!! And, more importantly, it Tastes Oh So Good! Enjoy! Have you been reading a few of the posts I’ve written? If so, you’ll remember that I posted about a Quinoa “Mac” and Cheese. Have you tried it yet? Isn’t it yummy? It really has all the indulgence of macaroni and cheese, but some goodness of the extra fiber and protein from the quinoa. Since we’ve been on a quinoa kick around here (it is just so nice to be able to buy it in bulk! 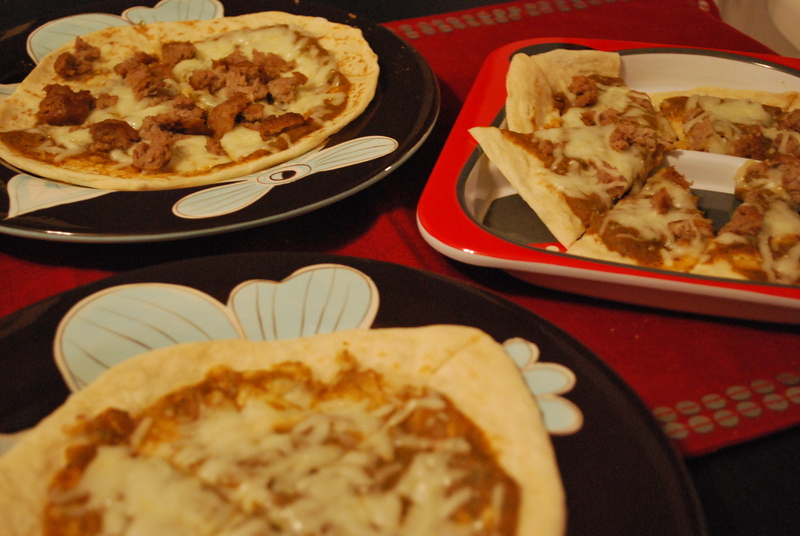 ), I wanted to think of another recipe that I could make that Olivia could eat for lunch while I was at work. Enter the Cheesy Quinoa Bites. I know, you’re probably thinking that these are just another spin on the Mac and Cheese – just in smaller ‘bites’ form. 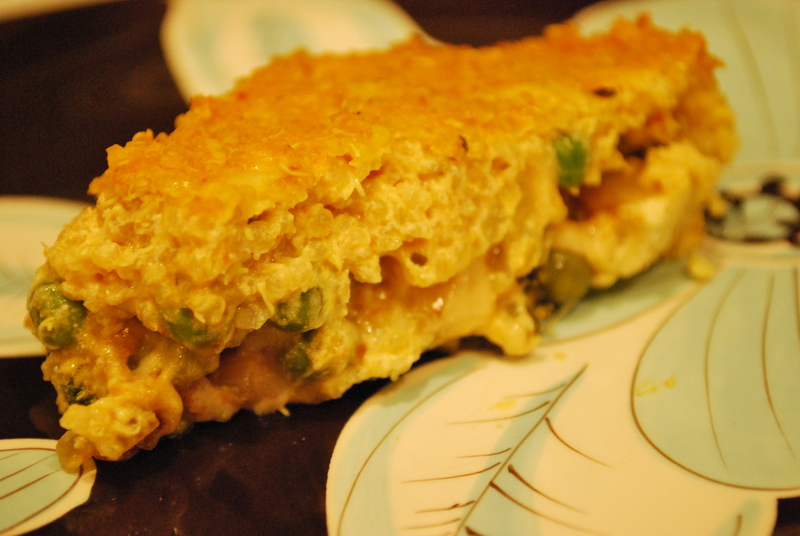 I promise you – although there are some similarities (cheese + quinoa), the addition of some white beans and the absence of the panko crust take it to another flavor dimension..whoa…flavor dimension. So deep. These little cheesy quinoa bites are packed full of protein and fiber from both the quinoa and white beans, packed full of nutrients from all the vegetables, and packed full of yummy taste from oh-so-yummy cheese. Honestly, you can’t lose! Another big perk is that they’re crazy easy to make and you can easily pop the whole batch in the refrigerator and warmed up. I haven’t done it myself, but you probably could even freeze them and just warm them up when you and baby are ready to eat them. Enough typing – let’s get started! 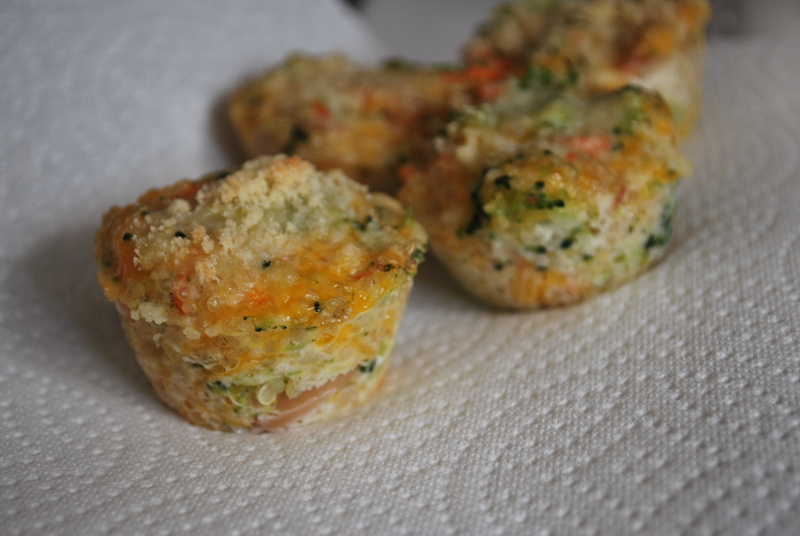 Grease up your mini-muffin tin. Grease up your tin. Preheat your oven to 350 degrees. 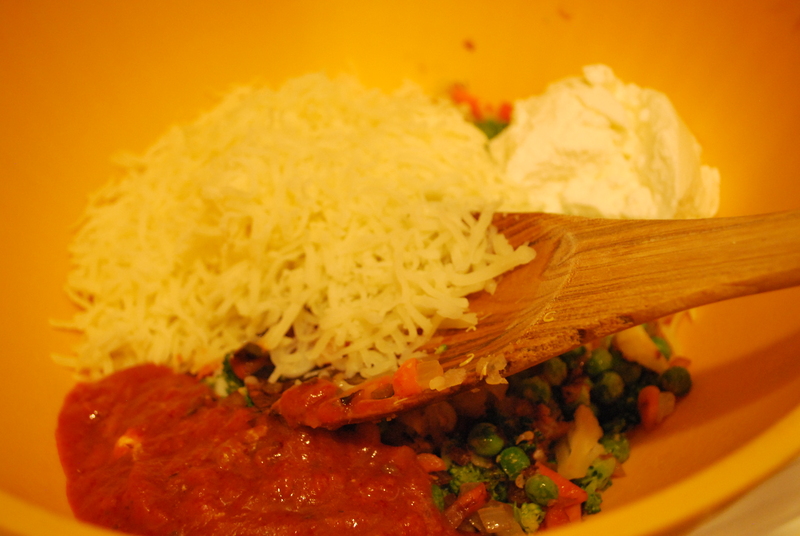 In a large mixing bowl, combine all the ingredients. 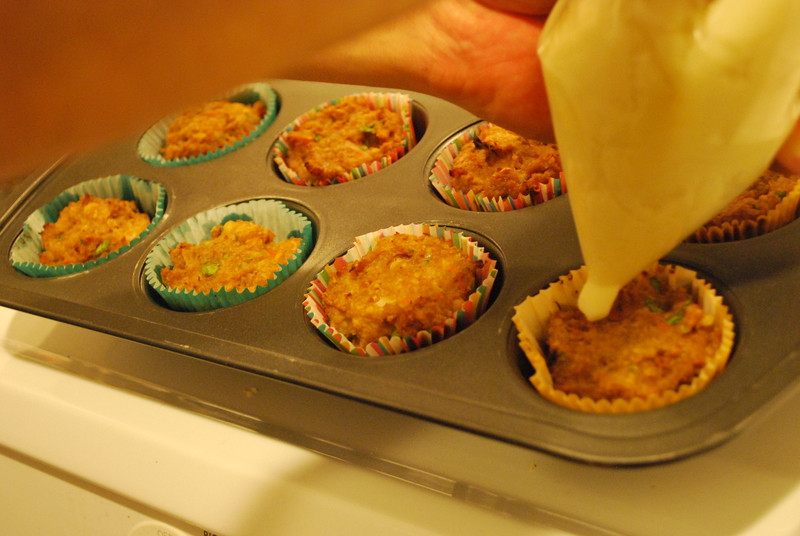 Portion out the mixture into the mini-muffin tins. They won’t really expand, so feel free to pack up each little muffin “well”! If you’re cheese lovers like we are, then feel free to sprinkle some Parmesan Cheese on top, or even some more shredded Cheddar cheese. Bake for about 20-25 minutes until the edges are starting to brown. Let them cool and pop em out! That’s it! So easy! This makes about 48 “bites”. Honestly, throw in whatever chopped veggies you have! Shredded zucchini? Yup! Cauliflower? Why not? Go veggie crazy! Whatever veggies (or even variety of cheese) you choose, you’ll take comfort in knowing you and family are eating something packed full of fiber, protein, and nutrients! Plus, they’re cheesy so you know they’ll Taste Oh-So-Good! Hey, what day is it? What day is it? Mike, Mike…what day is it? HUMP DAAAAAAY! And hump day means that I need to think of what I can prepare Olivia for lunch for the remainder of the week while I’m at work. I was trying to think of what to make when meatloaf kind of popped into my head. 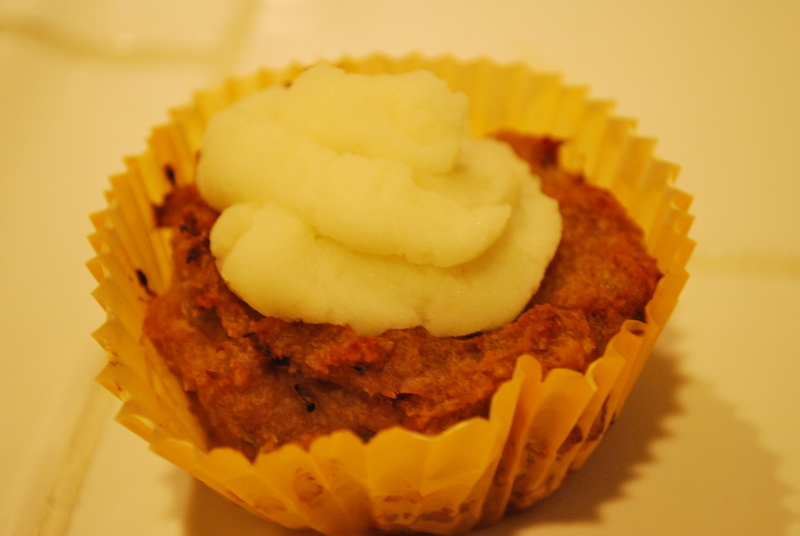 I remember pinning a Turkey Meatloaf “Cupcake” that Tyler Florence had posted on Parenting.com. [I co-admin on a fantastic closed group on Facebook that is all about “Feeding the Littles” and part of our page includes a Pinterest board that a few of us pin to – feel free to follow our Pinterest board!] 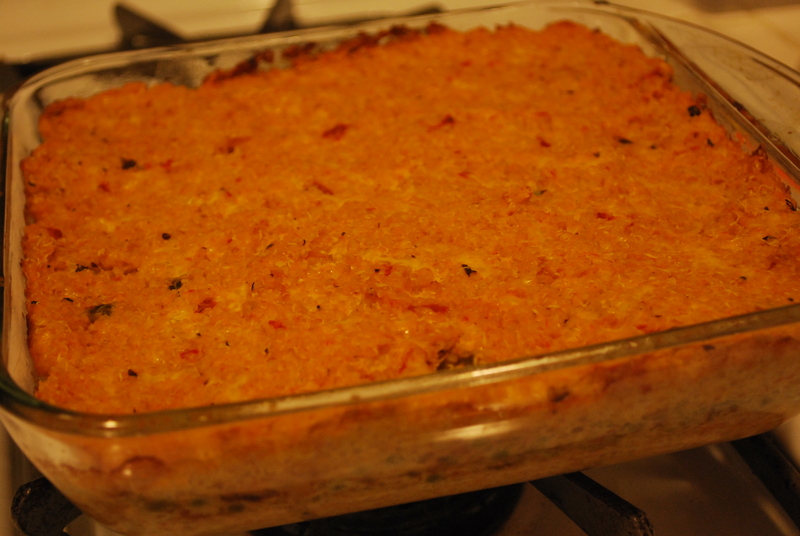 I decided to try out the recipe tonight with the small tweak of adding in diced carrots. Yes, I know I have said I don’t want to have to sneak in vegetables all the time to baby. But, I also believe that there is always a place for adding in extra veggies wherever you can – just tell your kid that there’s yummy veggies in it, too! The recipe also calls for crumbled cornbread (mmm…cornbread), but since we had none on hand, we used regular old breadcrumbs we had on hand from Trader Joe’s. And the last variation we had on ours – no bacon. I know…that’s the part of the recipe I wanted to keep in! But, again, we didn’t have any bacon on hand – so this will have to do for now! Next time, bacon for sure! I thought this recipe was so cute, too, because it has the added option of ‘frosting’ your ‘cupcake’ with mashed potatoes. Adorable. Preheat your oven to 400 degrees. You may want to go ahead and make your mashed potato frosting first so that it has time to cool so you can handle it while you’re “frosting” the cupcakes. Peel and cube the potatoes. Put it in a pot of salted water and bring the pot of potatoes to a boil. 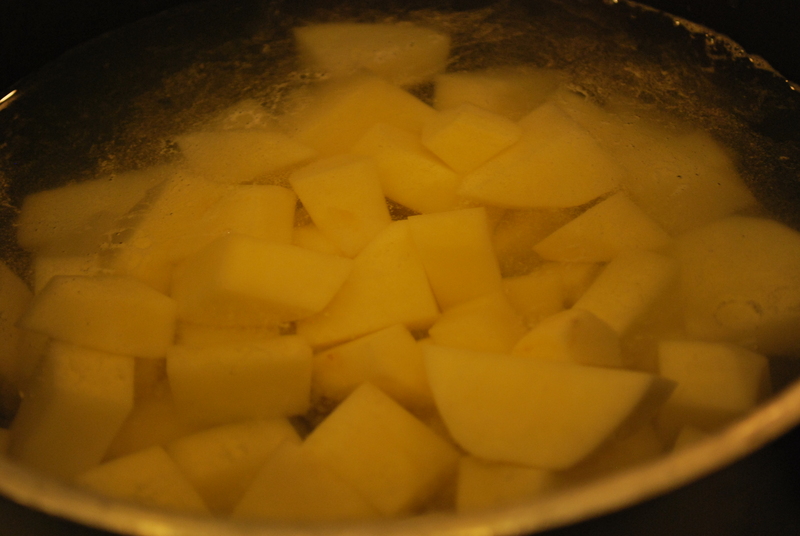 Boil for about 20 minutes until the potatoes are tender. Drain and just mash away. I added a little milk, a pat of butter, and a sprinkle of garlic powder. I decided not to use any salt (as I normally would in mashed potatoes) since 1) Olivia doesn’t need all that extra sodium and 2) there’s already enough flavor (and sodium) in the meatloaf from the barbecue sauce. Next, prepare your meatloaf cupcakes. 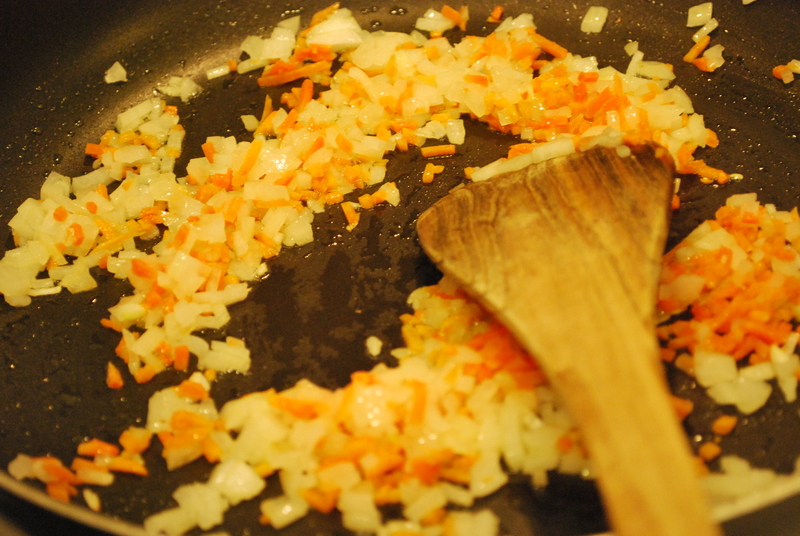 Saute your onions and carrots in the olive oil for a few minutes until soft and tender. Put aside when done. In a large bowl, combine your breadcrumbs and buttermilk. Wait for about 5 minutes, or until the buttermilk has fully absorbed into the breadcrumbs. 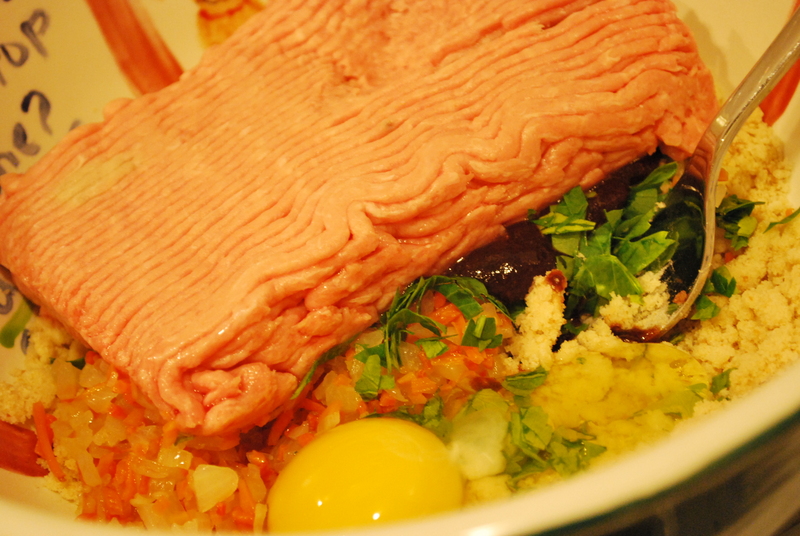 Add in your sauteed veggies, the ground turkey, the barbecue sauce, egg, & parsley. Here comes the fun part (or the gross part, depending on who you’re asking!). 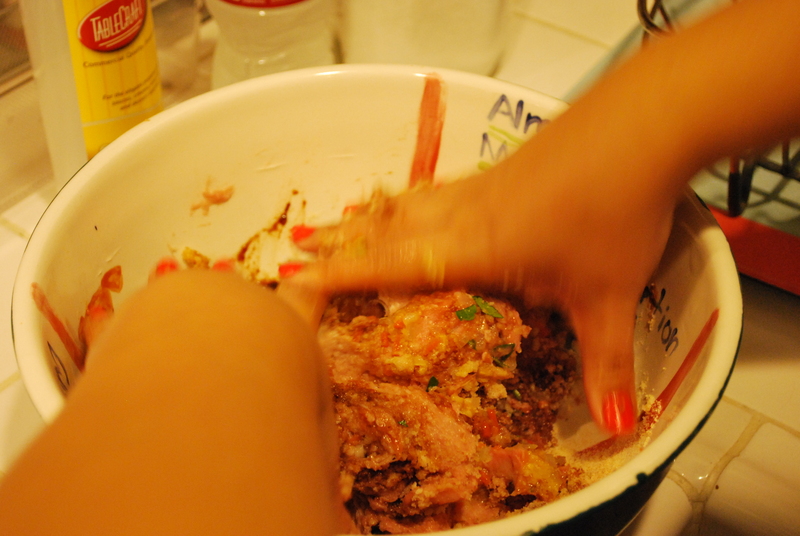 With clean hands, get in that mixture and massage it! Get all in it and make sure it’s mixed thoroughly. 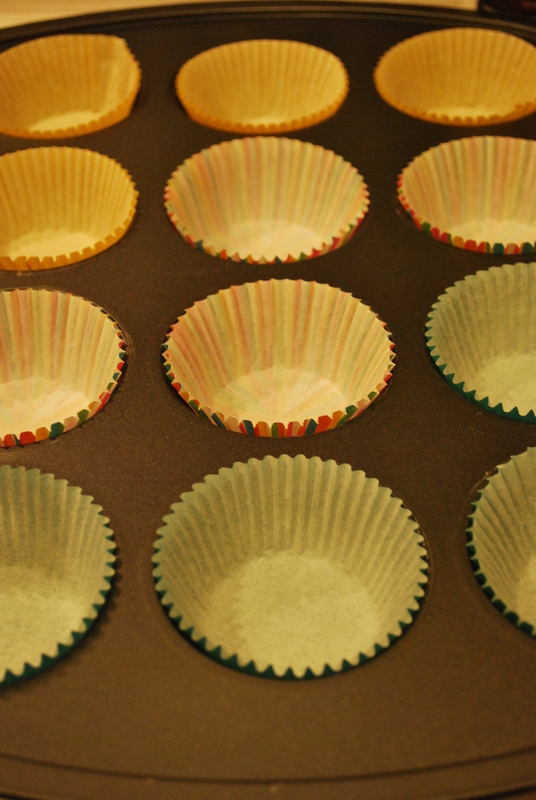 Divide the turkey mixture into the cupcake tin evenly. Pop into the oven and bake for about 20 minutes, until the meat is thoroughly cooked. 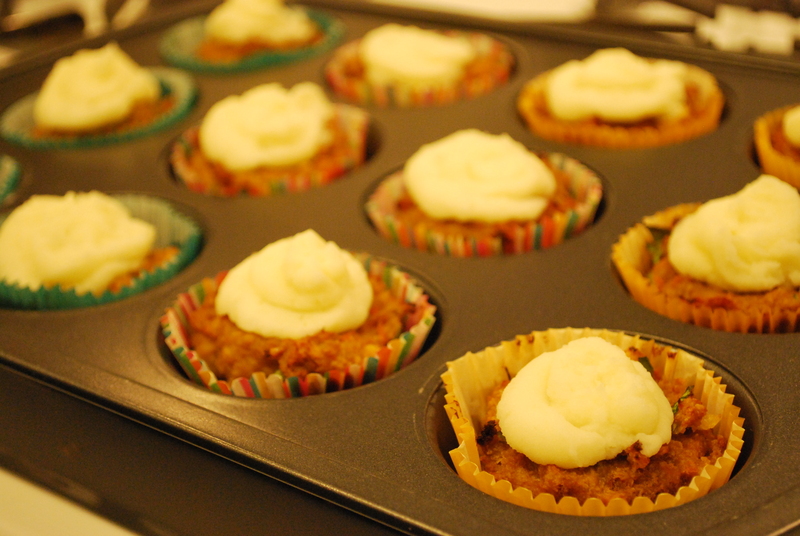 Let the “cupcakes” cool a bit and then frost with mashed potatoes! You’ll definitely want to wait for it to cool a bit, otherwise your mashed potato frosting will kind of…melt a bit. And there you have it! An adorable way to eat some yummy + healthy meatloaf! I’m not gluten-free nor do I have egg allergies, but a mom in that Facebook group I mentioned above gave me a great tip. If you’re either allergic to gluten or eggs (or both), just omit the breadcrumbs and eggs. Instead, substitute 1/3 cup flaxseed meal for every 2 pounds of meat. Just dump it in dry into your meat mixture. And voila! 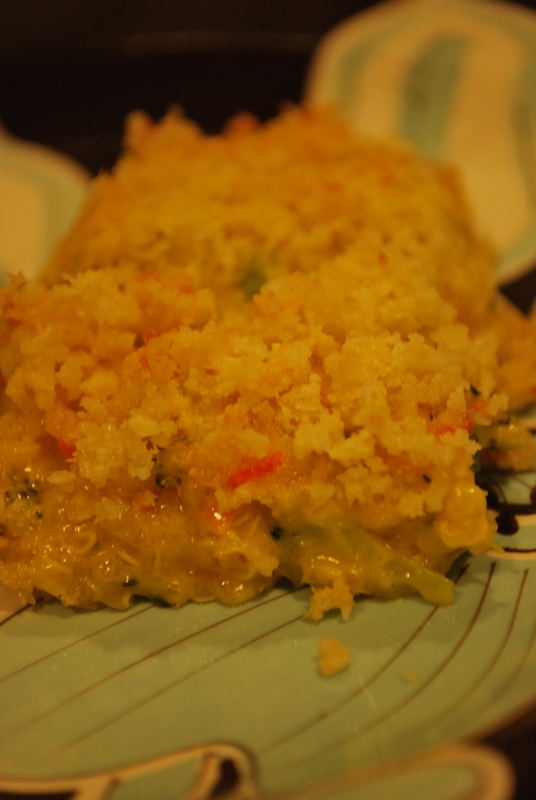 A great breadcrumb AND egg substitute! No matter what route you take – breadcrumbs/eggs or flaxseed meal, it will be a meal your family will enjoy! TJ and I tried one tonight. And trust me when I say…it Tastes Oh-So-Good! I know. It’s January, which means all of us are still trying to eat healthier for the new year. Am I right? We are supposed to be eating yummy salads all the time and feeling super fantastic about it. BUT let’s be realistic. I’m not eating salads left & right and baby girl sure would be mad if I just tried to feed her nothing but salad all day long. Yes, we all love some good salads and veggies. But we all need a little indulgence! So, instead, I’ve been trying to lighten up some comfort food and classics. That’s where this Quinoa “Mac” & Cheese comes in. Super indulgent with that yummy, creamy cheese sauce. But just a little less guilt-inducing using quinoa and throwing in some chopped veggies. I know, you’re saying to yourself “There’s cheese in that recipe!” “There’s butter!” You’re right. There’s all of that. But everything in moderation, right? It really is a win-win! Sure – maybe it doesn’t taste exactly like macaroni & cheese. But I can guarantee you this. It’s still yummy, the whole family will still love it, it’s filling, and it won’t make you feel like you’ve broken those New Year’s resolutions just yet! 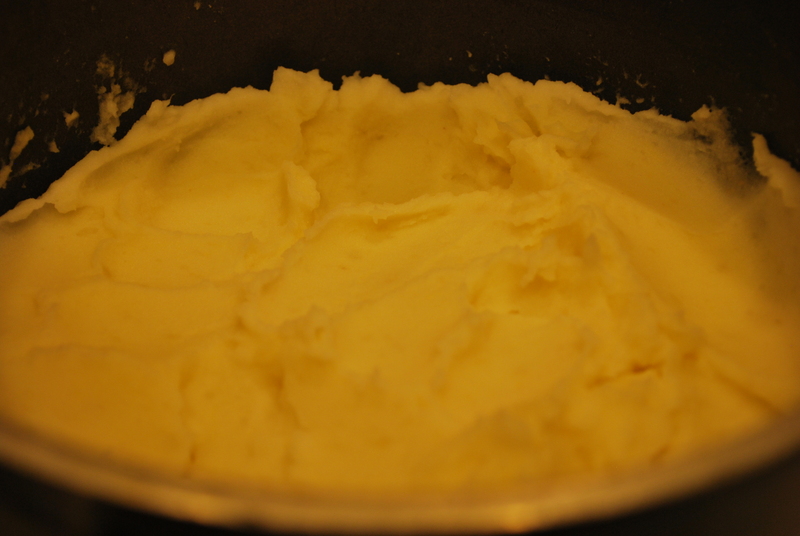 Preheat oven to 350 F. In a saucepan add 3 tablespoons of butter and melt it down over medium heat. Add the flour. Whisk continuously until a paste forms. Whisk in milk. Increase heat to medium/high and bring to a boil whisking the whole time. 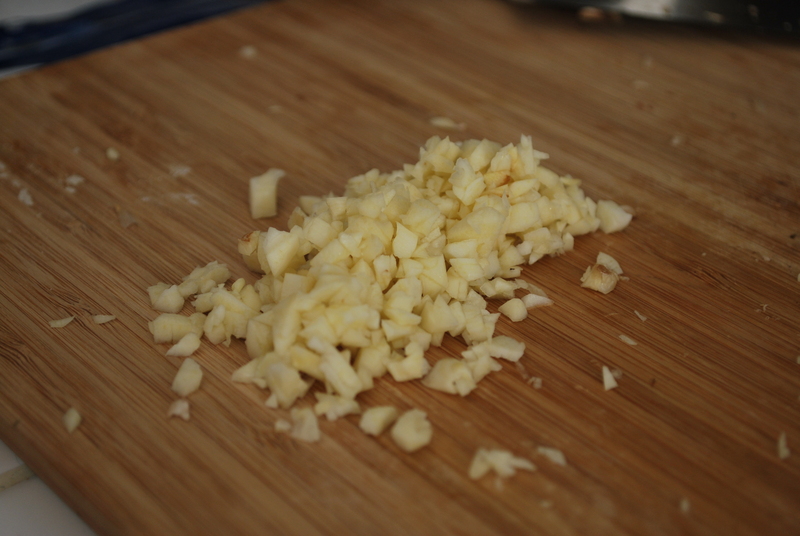 Stir in the nutmeg, salt and cheddar cheese. When sauce is smooth remove from heat. 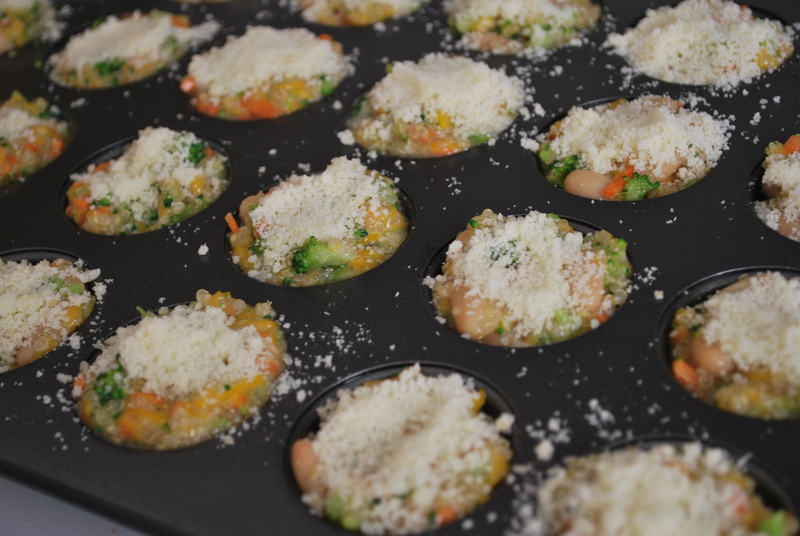 Throw in your veggies and quinoa into the cheese sauce. Transfer the mixture to a baking dish. We used an 8×8 baking dish. 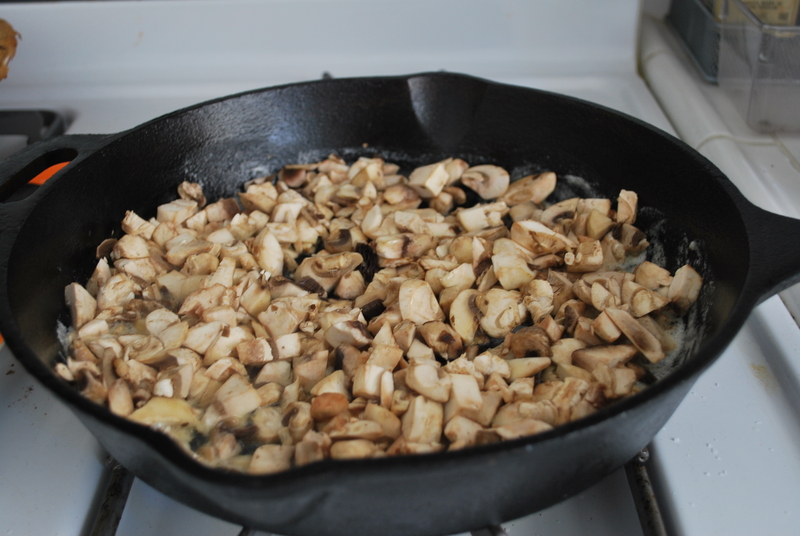 If you have a smaller cast iron skillet, I’d throw it in there. Since we have a larger cast iron, we didn’t want the mixture to turn out too thin in the skillet, so I would only throw in our Quinoa mac & cheese into our cast iron skillet if I 1.5x or 2x this recipe. In a small bowl, mix together the melted butter, Panko breadcrumbs, and Parmesan. 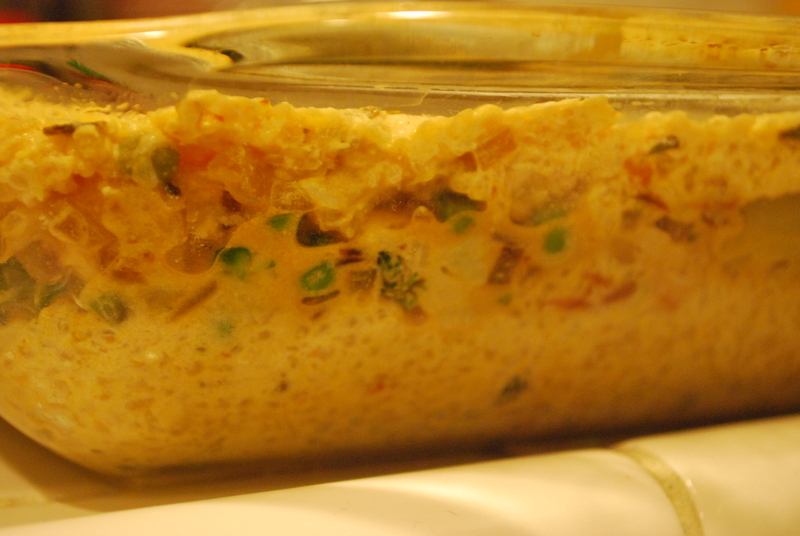 Sprinkle over the casserole and pop in the oven for about 20-25 minutes (until it’s bubbly). You could easily substitute in your favorite veggie in this dish – a few bunches of spinach? Kale? Mushrooms? Go veggie crazy! Add in those nutrients you crazy animal! No matter what veggies you use, no matter if you use a cast iron skillet or casserole dish, no matter if you use the more common white quinoa or less common black quinoa – I assure you this is a comfort dish you can feel less guilty about. Healthy comfort food that Tastes Oh-So-Good. 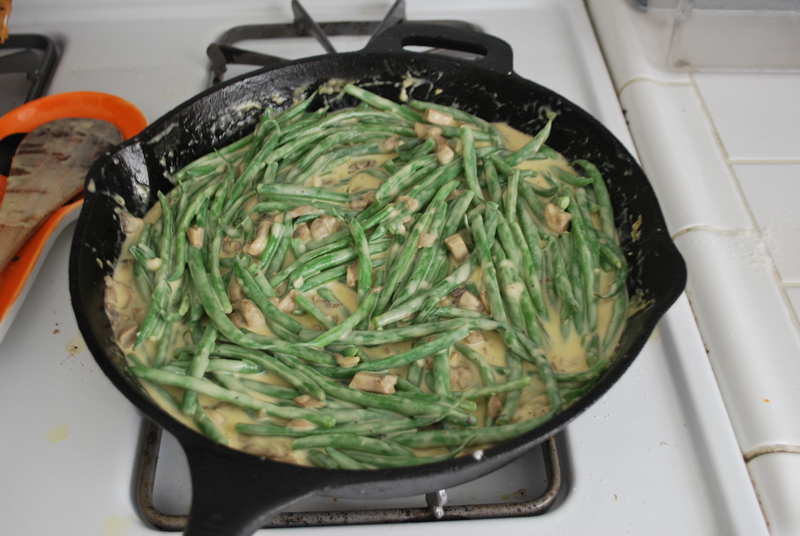 Green Bean Casserole – From Scratch! Green Bean Casserole. Yes. The dreaded potluck dish that everyone makes fun of. Goopy, overly salted, condensed cream of mushroom soup over green beans and greasy crispy onions that came out of a can. Lovely. Sounds yummy, right? Yeah – no wonder this dish is the bane of holiday potlucks everywhere! So, why am I posting about this dish? Because have you ever tried it made from scratch? Forget about that condensed mushroom stuff! Forget about those greasy stringy onions you pop out of a can! 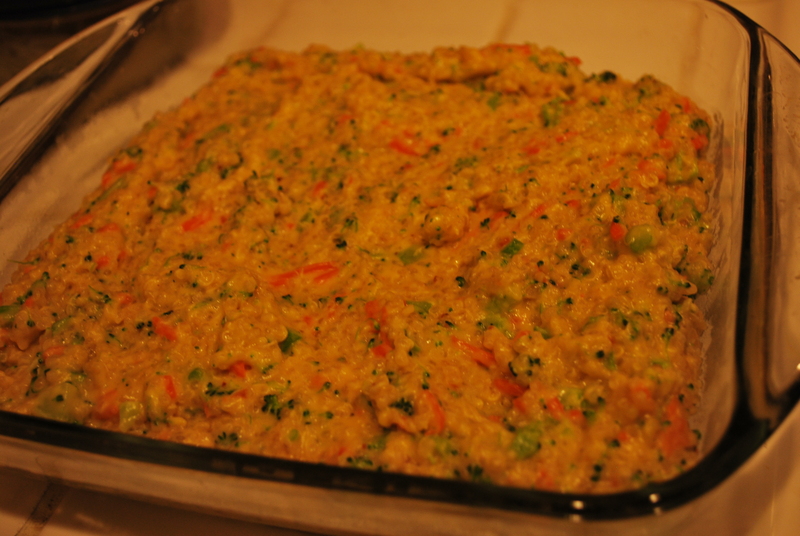 Made from scratch, this dish is an amazingly delicious side dish at any holiday gathering! I promise you it is worth the extra effort! Someone passed along this recipe and they got it from the amazing blog, Smitten Kitchen. The recipe is pretty perfect the way she wrote it. I’m not stupid enough to try and change too much, but we did just tweak it slightly for our tastes (read: extra garlic). Every year we try to do something special with our friends for the holidays. We’ve had Ugly Christmas Sweater parties with tons of friends, dinners for smaller groups, and a brunch. This year, with two babies in the group (ours and another cute lil girl), we decided we’d keep the shindig a little smaller and do a Friendmas Dinner with some of our closest friends. In addition to TJ’s yummy homemade apple pie and a so-tender-it-fell-off-the-bone brisket, we made the Green Bean casserole. All that, plus some delectable dishes our friends brought, we had a great time chowing down while spending time with some of our most beloved people. OK – enough with all that emotional lovey dovey stuff. Onto the recipe. I know you’re over hearing me gush about the amazing people in our lives! Fine, fine! Have it your way. Here’s the recipe. 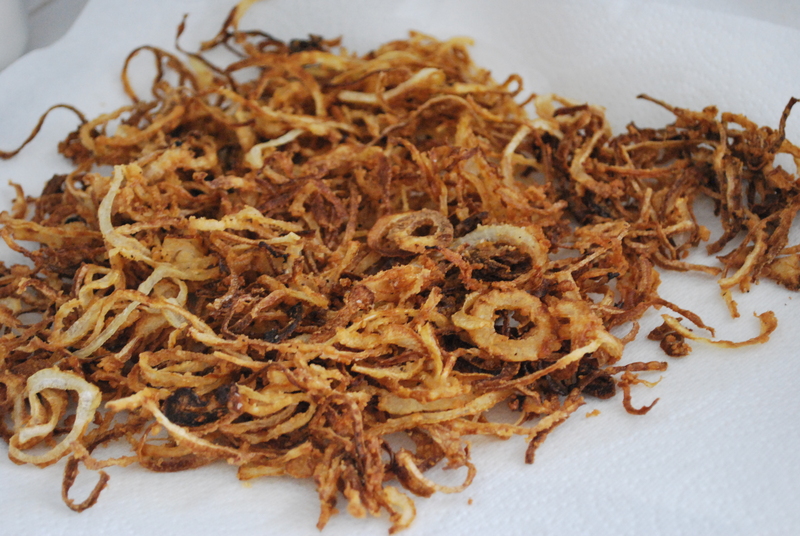 To make the crispy onions: Toss the onions in the flour, breadcrumbs, salt, and pepper. We filled our cast iron skillet with about 1/2 inch of canola oil. Heat the oil up. 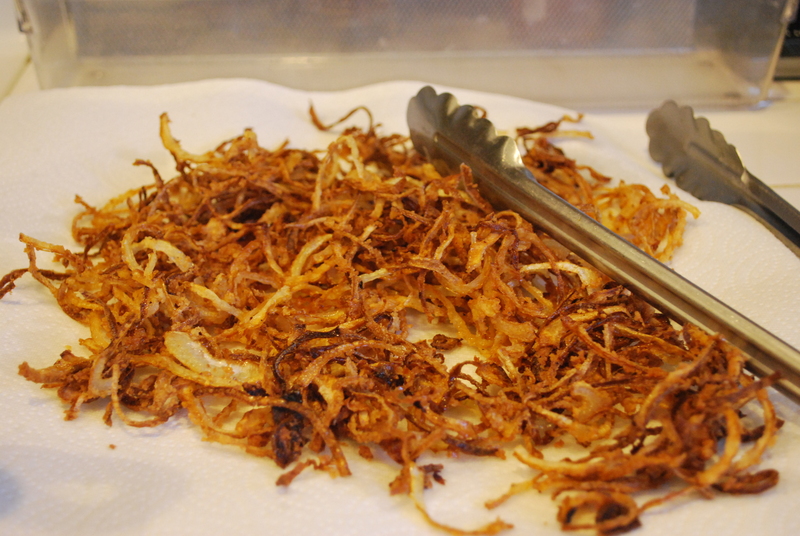 Add the onions a handful at a time and fry until lightly golden brown (don’t over-fry them – don’t forget they’re going into the oven afterwards!). Remove the onions with a slotted spoon and let the oil drip off a bit and then spread out the onions on a paper towel to drain. Repeat with the remaining onions and set aside when done. 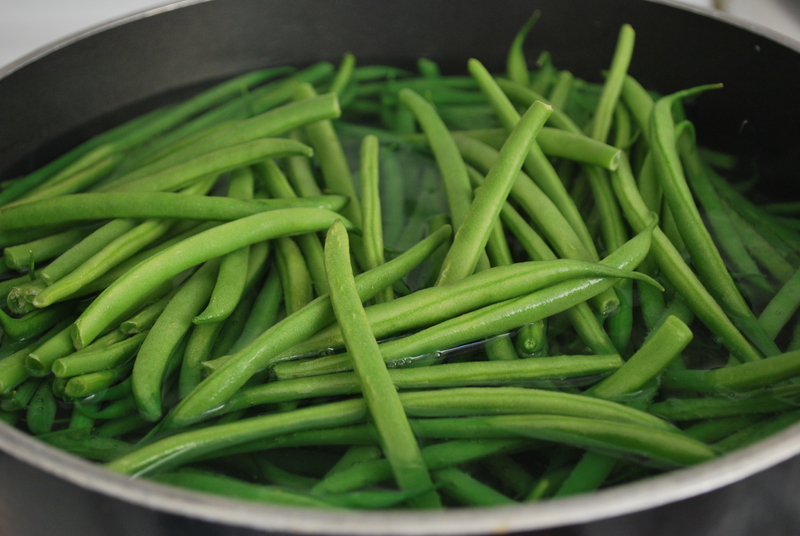 Prep the green beans: In a large pot, bring salted water to a boil and boil the green beans for about 5 minutes. Drain the beans and then plunge them into an ice bath so that they don’t continue to cook (again – they’ll continue to cook in the oven later so don’t overcook them now!). Drain the green beans again and set aside. to full stop them from cooking. Drain again, and set aside. 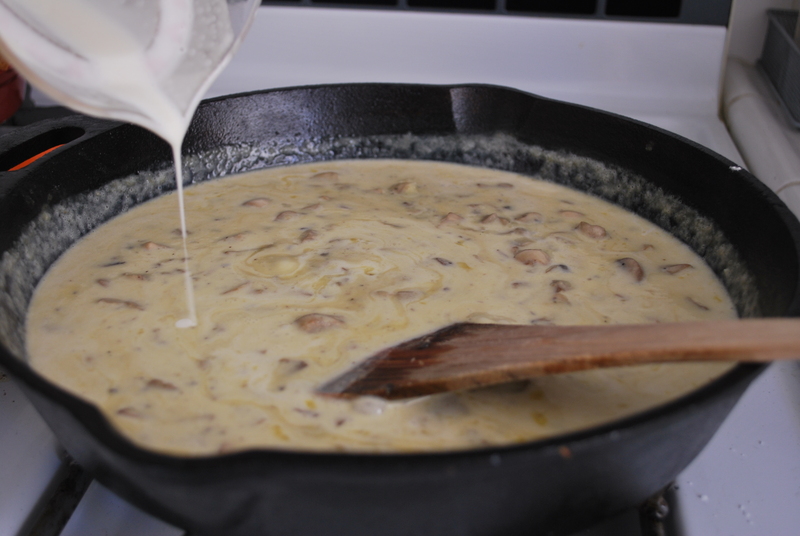 To make the creamy mushroom sauce: Over medium-high heat, melt butter in the bottom of your cast iron skillet. 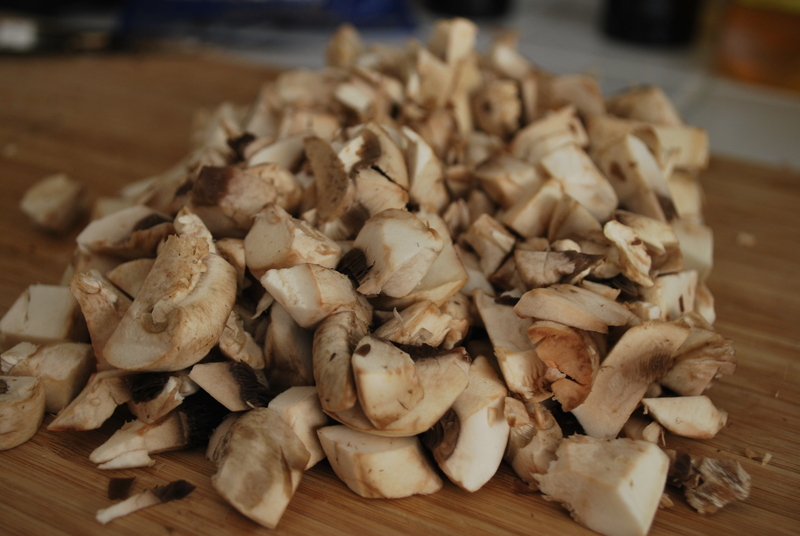 Add the mushrooms, salt and pepper and saute them for about 3 to 5 minutes. Add the garlic and saute one minute more. 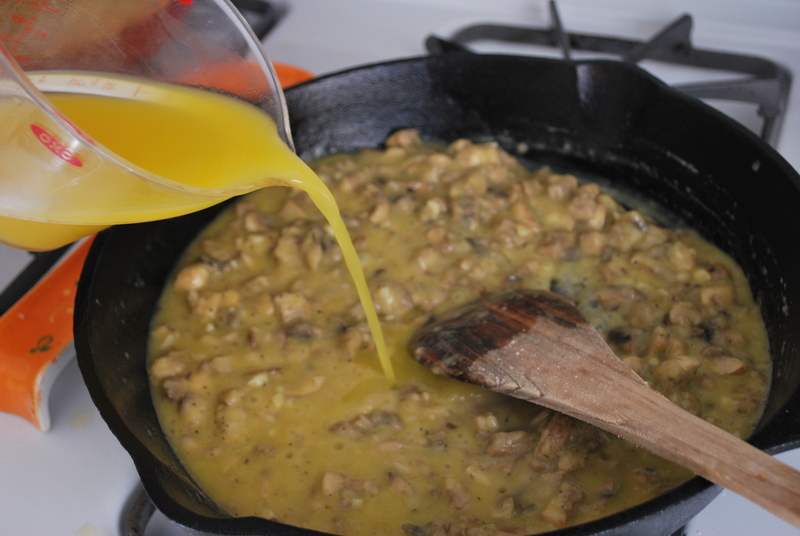 Add the flour and stir it until it fully coats the mushrooms. Add the broth, 1/4 cup at a time, stirring the whole time. Simmer mixture for 1 minute, then add cream and bring back to a simmer, cooking until the sauce thickens a bit, about 5 to 6 minutes, stirring frequently. 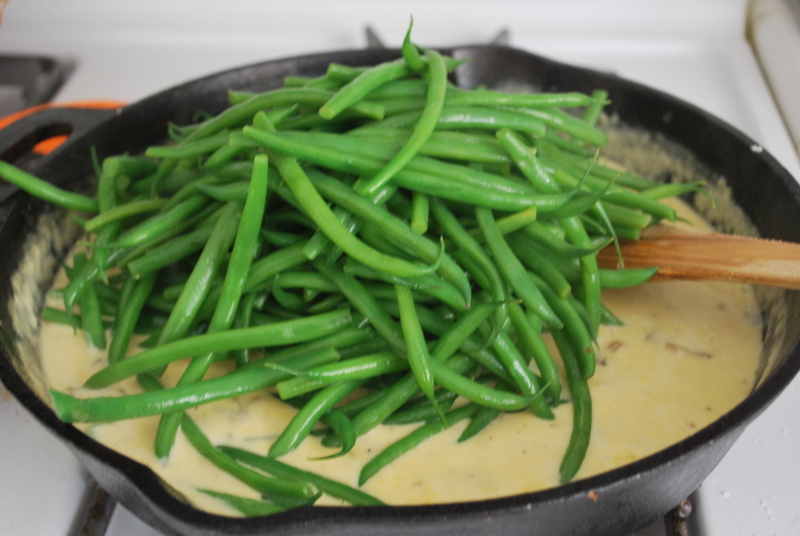 Coat the green beans in the creamy mushroom sauce. We did this directly in our cast iron skillet. Once the green beans are coated thoroughly, sprinkle the onions on top. Pop the cast iron skillet in the oven and bake the dish for about 15 minutes (the sauce will be bubbling and the onions will have gotten darker). Serve and eat when it’s warm! TJ and I actually assembled the green beans and creamy mushrooms the day before. The day of our Friendmas dinner, we then brought out our green beans and mushroom sauce and then topped it with the crispy onions and then popped it into the oven. Yes – I know there are sort of a lot of steps. And I know that it is so tempting to pop open that cream of mushroom soup you have in your cupboard instead of making your own. But I can guarantee you this. Making it from scratch is the perfect way to show your friends and family how much you care and making it from scratch guarantees you a dish that Tastes Oh-So-Good!